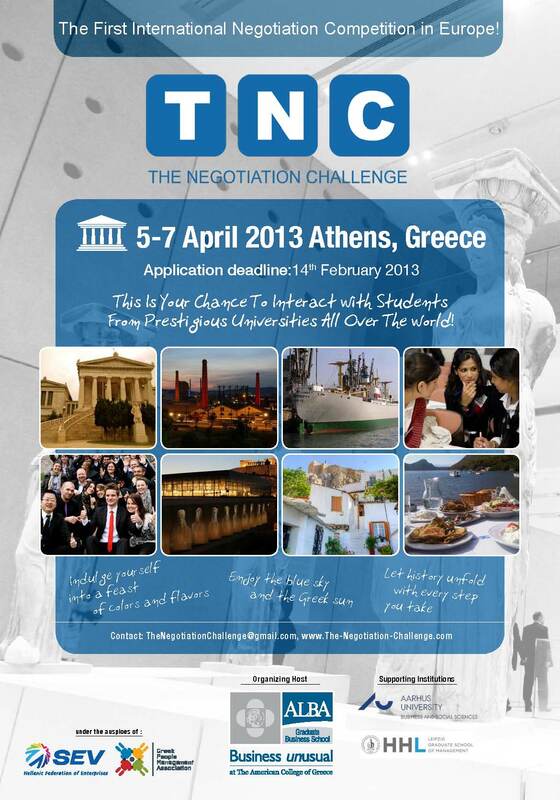 The Negotiation Challenge 2013 took place on April 5-7 in Athens, Greece. ALBA Graduate Business School at The American College of Greece organized and hosted this two day event during which the invited students had the chance to not only compete with each other but also to get a taste of the life in Athens . Team members, coaches and professors left Greece with unforgettable experiences and great memories to accompany them. Despite the extremely qualified participants and the intense competition, two teams stood out: those of the Reykjavik University in Iceland and the German HHL Leipzig Graduate School of Management, which met for the final in the breathtaking Acropolis Museum. Participants and guests had the opportunity to both admire the unique exhibits of the Museum and watch the finalists claim the trophy. For the selection of the winning team, ALBA had enlisted a group of eminent personalities from the academic and the business community. When Mr. Spyros Pappas, member of the Board of Management of the Athens University of Economics and Business, on behalf of the committee, announced the team from Iceland as the winners all celebrated this success, including the team from Leipzig, who, despite the normal disappointment enjoyed the highly prestigious second place. Feel the energy, enthusiasm and passion of the world best student negotiators who competed in The Negotiation Challenge 2013 in Athen captured on videos from the competition as well as from the final negotiation between Reykjavik University and HHL Leipzig Graduate School of Management.